1) Write a poem about me or inspired by me. It can be long or short, rhyming or not. It can even be a haiku. 2) Email the poem to me at norapoetry@verizon.net no later than midnight, October 1, 2010. You can enter as often as you like. 3)> Be sure to include your age, name, and a contact email. If you are under eighteen years old, please include the name of your parent or legal guardian, and their contact email (with their permission of course). Email addresses are only used to contact the winners in each age group. You will NOT be placed on any mailing lists and your contact information will not be shared with anyone else, ever, for any reason. All twelve winners will receive very special Nora Prizes. We will also give a special prize to the person submitting the best Nora or Nora-inspired haiku. In addition to the prizes awarded to the winners in each category, the winning poems will also be included in my “Inspired by Nora” 2012 calendar. Winners will each receive a copy. Submission of a poem signifies your acceptance of the above rules, and allows either me or my personal assistants, Betsy and Burnell, to print, reprint and otherwise distribute the poem for promotional purposes, including the creation of the 2012 “Inspired by Nora” calendar. Don’t delay. 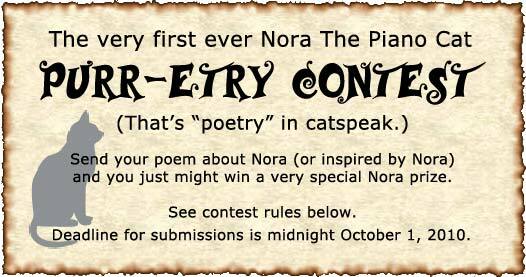 Send your Nora-inspired poems to norapoetry@verizon.net by midnight, October 1, 2010. Winners will be notified by October 31, 2010. Dear Nora, I have been a fan of yours since your first video. I am very impressed with your musical skills. I had two years of piano lessons when I was young, but you play better than I do. I didn’t know you had a blog until tonight. I have a blog, too. Maybe one day I will ask you for an interview. Do you ever do interviews? I’ve never done one, but I would be happy if you would be my first. You are so talented, and I can tell you are a real music lover, as am I. Keep practicing! I’m not yours, you’re mine. Frankly, I think most cat owners would say that says it all for these wonderful, lovable, Furballs….Meow.lol.